with a crew of four who did not survive the impact. 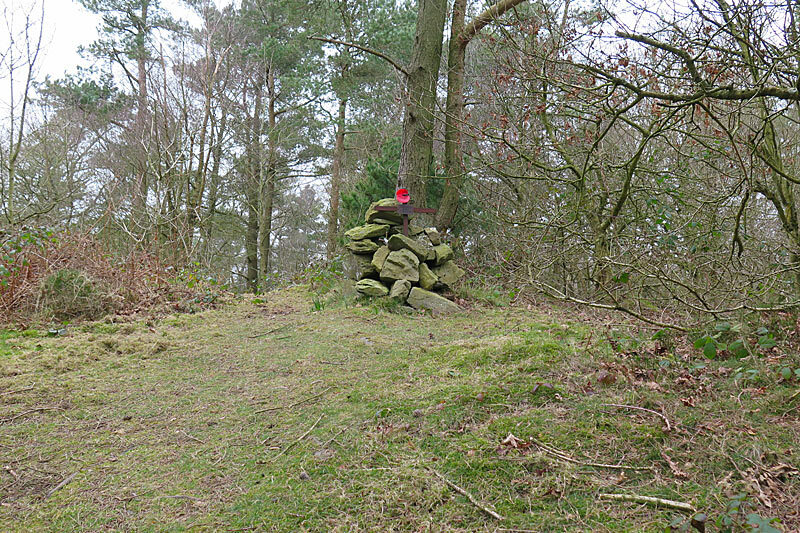 Summit of Cwm Mountain, St Asaph, North Wales. 21.75 miles west of Speke Airport. A marker on this map shows the rough position. On the morning of December 5th the aircraft flew from Bovingdon to Lille, France, where it was loaded with 96 bales of fabric with a total weight of 6380 kg (14036 lbs). The aircraft was constructed by Handley Page Ltd and its flight tests were completed in March 1945. It was purchased by the Lancashire Aircraft Corporation from the Ministry of Supply and went back to Handley Page for a Certificate of Airworthiness overhaul. The certificate was issued on 25th September 1947. On that date the aircraft’s total flying time was 12 hours 40 minutes. At the time of the crash the flying time was approx 215 hours. Three of the Hercules engines were made by the Bristol Aeroplane Company and had each completed 215 hours since new. The port inner engine was built by the Rover Company and had done 219 hours. W/T means Wireless Telegraphy and was communication by morse code, using a morse key. R/T is Radio Telephony which is voice communication. Flight Details taken from the Accident Report. W/T communication with Uxbridge Area Control was established at 1506 hrs. The aircraft reported that at 1456 hrs its position was 51.03N 02.23E, height 2,500 ft.
At 1518 hrs the aircraft reported its position for 1515 hrs as “Over East Coast, altitude 2,500 ft”. Uxbridge replied “Establish communication with Manchester (Ringway)”. The Northern Area Control Logs showed that communication with G-AIHU was not established. Enquiries revealed, however, that G-AIHU’s call sign was heard and noted at 1559 hrs, whilst a transmission to another aircraft was in operation. Upon completion of that signal the Northern Area operator called G-AIHU at 1602 hrs and again at 1604 hrs but failed to make contact. Neither the Control Officer nor the Control Clerk was informed of this occurrence. The next message from the aircraft was received at 1605 hrs by approach control, Speke Airport, requesting a QTE (A true bearing from Speke). This was taken and passed back to the aircraft as 134 degrees. The aircraft acknowledged this signal and replied “QAD Lille 1438 QAB GJEA QAH 2500 ft.” (Departed Lille 1438 hrs, my destination is Speke, my altitude is 2500 ft). On acknowledgement Speke added a request for QAA (Estimated time of arrival) to which the aircraft replied “wait”. At 1610 hrs the aircraft came back with QAA GJEA 1620z (my ETA at Speke is 1620 hrs gmt). At 1613 hrs Speke called the aircraft and said “QGL QHZ QBV 2000 QGP2 QSY R/T” (you may enter the zone, circle the aerodrome, report reaching 2000 ft, your turn for landing is number 2, send on R/T). “Send on R/T” indicated that the Approach Controller handed the aircraft to the Aerodrome Controller with whom R/T communication should be established. In the normal course of events the Approach Controller would have received no further messages from the aircraft. R/T communication with the Aerodrome Controller, however, was not established and the wireless operator of Approach Control attempted to re-open communication at 1626 hrs and 1627 hrs, but without success. This indicated to the approach controller that R/T communication with Aerodrome Control could not be effected and that the aircraft required landing instructions by W/T. At 1632 hrs the aircraft requested a QDM (Magnetic course to steer, with zero wind, to reach Speke). This was passed as 090 degrees and was immediately followed by the landing instructions signal “QHG QHE2 QGP1 QFM 1000 ft”. (You are cleared to enter the traffic circuit, inform me when you are on the down-wind leg, your turn for landing is No.1, maintain (or fly at) an altitude of 1000 ft. Receipt of this message was acknowledged. At 1635 hrs the Approach Controller originated the signal QTH? QAA? (What is your position? What is your ETA?). An acknowledgement of this message was the aircraft’s last signal. From the evidence of witnesses it has been established that at approximately 1615 hrs G-AIHU was flying at 400 to 450 ft over Hooton Park aerodrome and heading towards West Kirby, on the N.E. Coast of the Wirral Peninsula. It is believed that the aircraft flew out to sea, as at 1630 hrs the attention of a policeman at Prestatyn was attracted by a four engined aircraft flying low in a south westerly direction. Another witness stated that he was just south of Rhyl when he sighted a four engined aircraft flying so low that he flung himself to the ground as he thought the aircraft would hit some nearby trees but that it flew on in a south westerly direction. An army officer at Kinmel Park Camp, Bodelwyddan, 5 miles west of Cwm Mountain, stated that at about 1630 hrs he heard a low flying aircraft, obscured by mist, flying in an easterly direction. 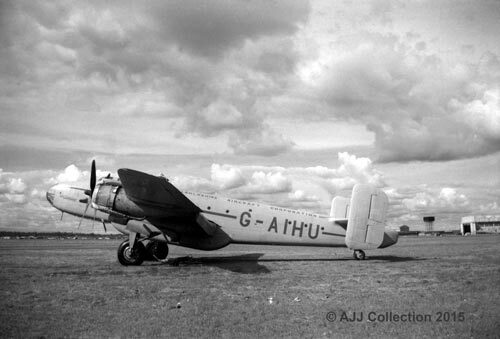 At St Asaph, 2.5 miles from the scene of the accident, another witness stated that he saw G-AIHU flying low with its undercarriage down and engines emitting an irregular running note, heading towards Cwm. The evidence of witnesses situated nearer to the scene of the accident showed that the aircraft continued in straight flight until striking the cloud obscured hill. An inspection at the scene of the accident showed that the aircraft was travelling at high speed when it struck a group of fir trees growing approximately 10 ft below the summit of the thickly wooded Cwm Mountain, the height of which is 998 feet above sea level. Nine fir trees were snapped off 30 ft above the ground by the first impact. The wreckage trail spread down the eastern slope of the hill in a direction of 85 degrees M and extended for 400 yards, through bushes and undergrowth. The trail revealed continuous disintegration of wing, fuselage and undercarriage structure; the engines were torn from their mountings and small fires had been centred around burst fuel tanks. The trail culminated in the main wreckage where the rear portion of the fuselage was in an inverted position. Nearby lay the twisted debris of the pilot’s compartment, the port wing and undercarriage and the burnt out remains of the starboard wing. A technical examination showed that the undercarriage and flaps were retracted at the moment of impact and that the engines were running under power. The pilot’s altimeter was not recovered. Mr John H. Parsonage joined the R.A.F. On 12th April 1938 and was awarded his pilot’s flying badge on 31st July 1942. His R.A.F. Duties included operational flights in Halifax aircraft. He was released from the R.A.F. on 26th January 1947 upon the completion of his service. He passed a general flying test on 2nd July 1947 and was granted a Class ‘B’ pilot’s license on 3rd September 1947 and was subsequently endorsed for Haltons. He had completed approximately 2,000 flying hours, of which 1,025 hours were in Halifaxes. His night flying hours totalled 580. According to his service logbook he had carried out 56 hours of instrument flying of which 20 hours were as 1st pilot. Link trainer instruction was stated to be 49 hours. The records of the operating company show that this officer had operated 120 hours as 1st pilot since engagement. Mr John Driver applied for his ‘B’ License on 30th September 1946 and then stated that he had completed 552 hours flying as 1st pilot during his service in the R.A.F.V.R. His ‘B’ license, No. 24161 was granted on 11th January 1947 and was endorsed for Haltons. It was valid at the time of the accident. The operating company state that he had completed 175 hours flying in this type. On this flight he also undertook the duties of Flight Engineer. Mr Allan Brook stated that his navigational experience in the R.A.F. Amounted to 843 hours by day and 263 by night, of which 750 hours were on trans-atlantic ferry duty using astro and radio aids only. He was issued with a modified 1st Class Navigator’s license No. 2319 on 28th July 1947. Mr John E. Evans applied for a Radiotelegraphy License on 26th February 1947. He then stated that he had carried out 5½ years service in the R.A.F. and Transport Command and had 1650 hours flying experience. A provisional Certificate of Proficiency No.1386 was granted on 17th April 1947 after an examination. According to the operating company Mr Evans had flown 181 hours for them as Radio Officer. At Lille a flight plan was submitted to Control indicating a direct flight to Speke in I.F.R (instrument Flight Rules) conditions in an estimated time of 1½ hours. Before departure at 1438 hrs GMT. The pilot was briefed about the poor weather over England. The aircraft established W/T communication with Uxbridge Area Control during the early part of the flight and three times reported its position. The las plot showed that 57 minutes after take-off the aircraft was 31 miles off its course. The weather at Speke Airport at 1625 hours was Fog. Visibility 900 yards. Clouds 4/10 at 1200 feet, 9/10 at 2500 feet. Wind NE by E 13 mph. QFE 974mb, QFF 976mb. The local weather at the time of the accident (from local witnesses) was Fog, Continuous slight drizzle, top of the mountain obscured by clouds. Jean Kerfoot Ashton sparked my interest when she told be about this incident. She was 10 years old at the time of the crash. Her father, William Kerfoot Davies was an agricultural and haulage contractor and had a wagon with a canvas canopy over the back which was fitted with seats and a light to carry men to work. They lived on Thomas Avenue, Dyserth. Kerfoot Davies later set up Voel Coaches. Her younger brother, Stuart, was with his friend, Elwyn Jones at the playground when they heard the aircraft crash into the hillside and rushed home to tell his mother - who at first didn’t believe them. The local policeman, PC Price, lived next door to the family and asked Kerfoot if he would take his wagon onto Cwm Mountain to the crash site. He drove there with the policeman and they brought the bodies of the 4 aircrew back to the village. As there were trees on the mountain she thinks that they got the wagon as far as the cottage called Aelwyd Ucha and brought the bodies to that point. She recalls that the collection of the bodies was not discussed. The aircraft was carrying bales of cloth that were strewn over the mountain and Jean remembers that everyone in the village, including PC Price, had something made from it. She had a gymslip, her brothers Stuart and Melvyn maybe had shorts and most men had a suit, including Price the Policeman. There was a lady who was a tailor living next door and she made up the clothing. As children she remembers going onto the mountain and collecting parts of the aircraft, in particular some plastic, that if you burnt a hole in it it could become a ring. Other people have told me they remember finding plastic that they could burn holes in with a hot poker and make rings.